The design process begins with a consultation to determine how and when your space will be used, architectural features which should be highlighted, safety/security concerns and the mood you wish to create. 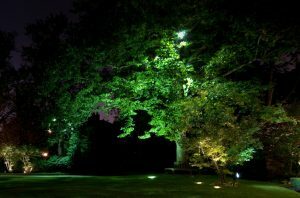 Your customized lighting design will mix light and shadow with various features and fixtures to bring your space to life with a visual story that welcomes guests, entertains and provides a beautiful oasis. What types of lighting might we use? 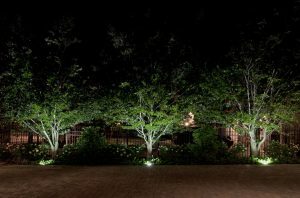 More than just a means of providing a safe and secure path, Pathlighting can create anticipation, movement and intrigue. This attention grabbing effect dramatically highlights features, adds depth to the landscape and creates exciting shadows. Especially effective when through foliage on breezy nights. 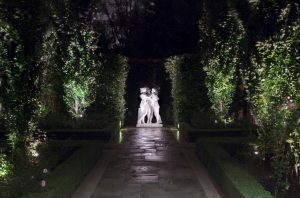 Create a sensory experience with that mirrors the effect of Moonlight on the landscape. Particularly effective through foliage. 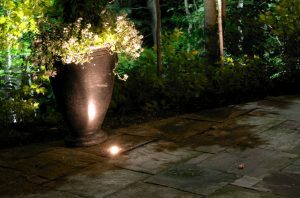 Highlight a statue or allow a striking planting to stand out in the landscape. Shadows, highlights and lighting intensity all play a factor in making feature accents come to life. 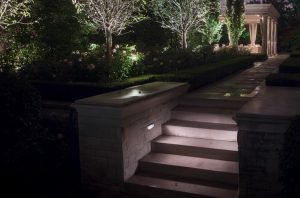 Highlight architectural features to allow them to assume a subtle importance in the landscape. Tread lighting brings safety and presence to transitional spaces. 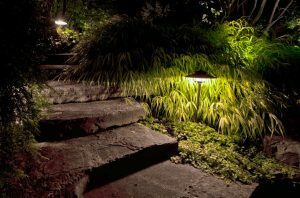 Whether providing a welcoming entrance or an invitation to explore all parts of the landscape, elegant tread lighting can give stairways a subtle glow or surprising drama.